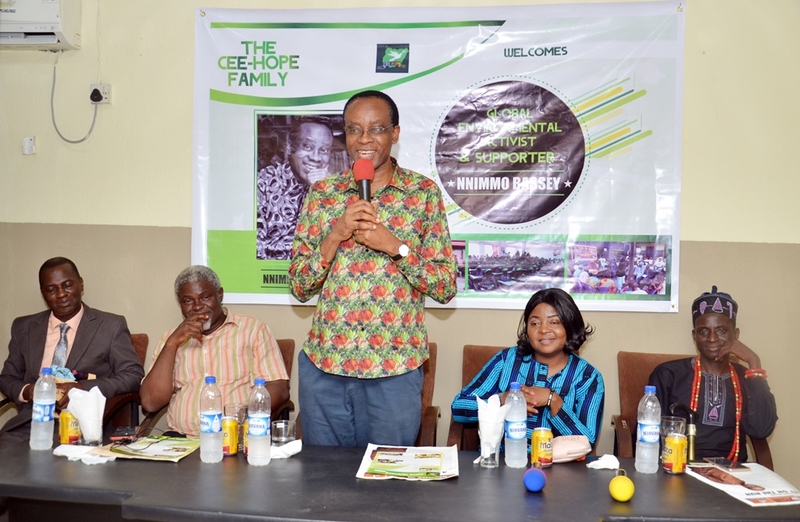 A Lagos-based Non-Governmental Organisation, Centre for Children’s Health Education, Orientation and Protection (CEE-HOPE), has honoured a foremost environmentalist, Rev. Nnimmo Bassey as part of celebration of his 60th birthday in Lagos. The event which held at the International Press Centre (IPC), Ogba, Lagos preceded an eventual commissioning of a community centre, office of the organisation in Makoko slum of Lagos where it has its biggest community project for venerable slum children. 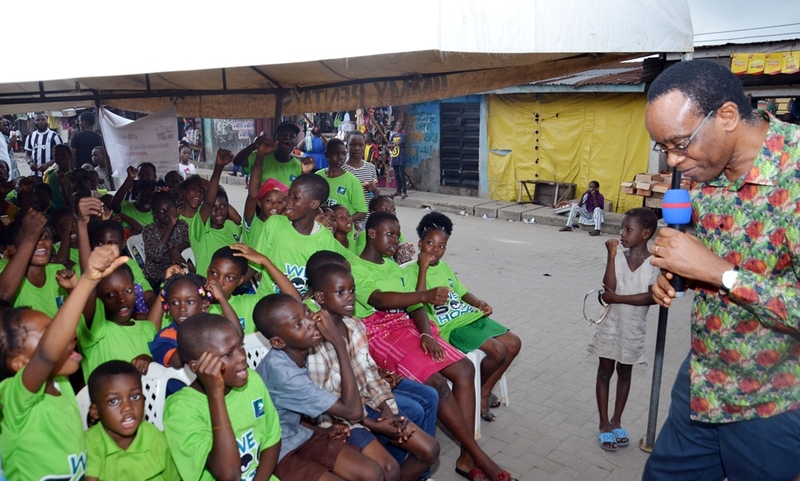 CEE-HOPE is an NGO that focuses on the rights and welfare of vulnerable children which it has championed in the Makoko slums and other impoverished locations for years. Earlier in the day, participants took turn to eulogise Nnimmo Bassey, a trained architect and writer and co-founder of the Environmental Rights Action/Friends of the Earth Nigeria, who runs the Heath of Mother earth Foundation, HOMEF), and who was the reason for the first leg of the event at the IPC. A member of the board of CEE-HOPE, Mr. Lekan Otufodunrin at the event appreciated the celebrant, appreciating him for the mentorship and support for the organisation. “There is one thing to have a vision and there is another thing to have passion but you also need help. We really appreciate the support Rev. Bassey has given to CEE-HOPE. So many advocacies are going on around the world and we thank you for all you are doing,” Otufodunrin said. Otufodunrin, Online Editor at The Nation Newspaper also prayed for more strength and health for the man being honoured at the event. The scholar explained what Bassey meant to him and the environment in Nigeria and around the world. “He has written a whole lot of poems and I still keep and treasure my copy of his poems. He was known to be one outspoken person, he is someone that wakes up with a dream and makes sure he actualises that dream,” Akanni said. Betty Abah, Executive Director of CEE-HOPE and organiser of the event, said Bassey deserved a celebration for being an exemplary Nigerian, a quintessential boss who has supported the CEE-HOPE vision in the last four years plus. ‘We are celebrating a man of integrity and unflinching principles, a scholar, a workaholic and genius from whom we have a lot to learn and I am very privileged to have worked under him for over six years’, she said. Abah narrated how, on June 11, former and present staff and some family members gave Bassey a surprise birthday party in Abuja that brought together activists, government officers and several other personamilities. Amidst the crowd, she said, were his old and former staff from ERA, some dating back to 20 years. ‘It all goes to show the kind of person Nnimmo is, someone who invests in the welfare and development of his staff, even after they leave, just like I have had the privilege to enjoy such gestures. He is a father to all,’ she added. Indeed, the audience included current members of ERA including Akinbode Oluwafemi, the Deputy Executive Director of ERA, and Tunji Buhari and Veronica Ivoke, all of ERA. Mr. Oluwafemi said he has been motivated by Bassey who he learnt activism from many years ago. “Nnimmo is our teacher, our mentor and we have learnt activism from him. He led us into activism even when some of us didn’t know that what we were doing was activism but he taught us. Nnimmo taught me humility, I knew what humility means. I saw it in him. I have learnt a lot from him,” he said. Others who spoke include Ugomah Cokey, an Assistant Director, News at the Voice of Nigeria who appreciated the celebrant for always being ready to mentor young people, Sunday Oyeogun, a chief from Agbado-Oja community in Ogun State (where CEE-HOPE also works with girls), Mr. Adeyemi Adeyemo, Chief Executive Officer of Treasure House of Comics, Mariam Kusika, leader of CEE-HOPE’s Triple G girl empowerment club from Makoko and others. Present also at the event was Victoria Ibezim-Ohaeri, Executive Director of Spaces for Change, an NGO. Responding to the comments, the celebrant, Rev. Nnimmo Bassey was full of appreciation at the event which he said was a surprise to him. “Let me mention that this is a big surprise to me. As we were coming here today, I was asking what is happening, what is the agenda of the event? Betty never mentioned anything, it is a big surprise to me and I am very grateful,” he said. Talking to the students from Makoko who had come to grace the occasion, Bassey told them how lucky they are to belong to this generation. “Every generation always feels their generation is better. Things may be tough but the world is getting better. When I was a young man, to make a phone call you would go and line up in NITEL office or you would tell your neighbor who had a telephone line that you were coming to receive a call by 4pm but today every family has a phone,” he said, commending young people on their tech savvy nature. 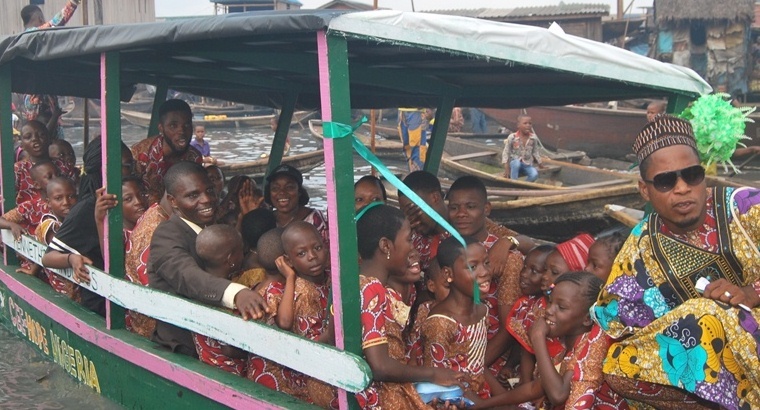 The celebration train later moved to Makoko, a fishing community, Nigeria and West Africa’s largest slum settlement also known as ‘the city on water’ based on their peculiar housing architecture where houses are built on stilts over the Lagos lagoon. 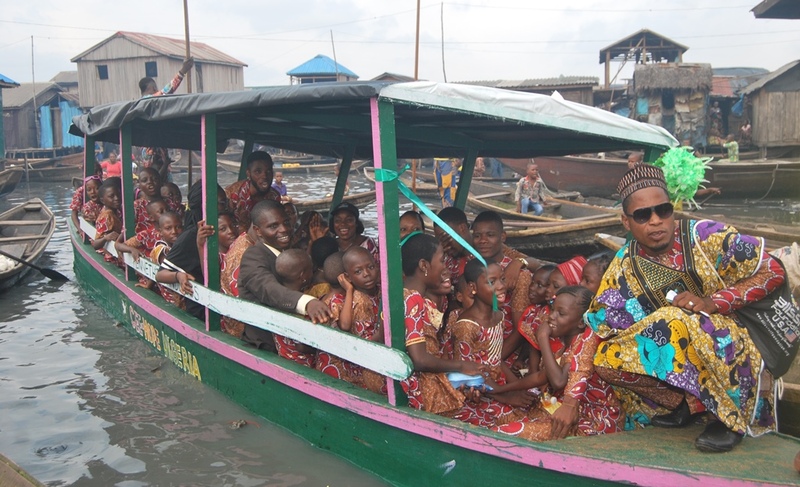 At Makoko, both eminent local chief and young people trooped out in their hundreds to welcome Nnimmo Bassey. Four different dance troupes consisting of young people entertained him, some with songs composed specifically in his honour. They sang and danced in indigenous Egun and Ilaje languages complete with drums, native costumes and other traditional symbols. It was a colourful affair. Local chiefs including Chief Albert Aide, Chief Adewale Akintimehin, Baale Aji, Baale Shemedeh, Baale Sodique and many others came to honour him. Baale Aide, Baale Sodique, Chief Akintomehin and others praised the work of Abah through CEE-HOPE especially in the intervention and developmental programs for the young people of the community, especially girls. In response, Nnimmo promised continued support for the community which has come under several forced demolition attacks from the Lagos State Government even against existing court restriction orders, destroying properties and sometimes claiming lives. ‘Slums should be upgraded, not demolished, because human lives are involved and life is sacred’, he said. He presented educational scholarship funds to 10 Makoko children, promising to increase the number to 20 next year, after declaring open the CEE-HOPE Community Empowerment Centre. 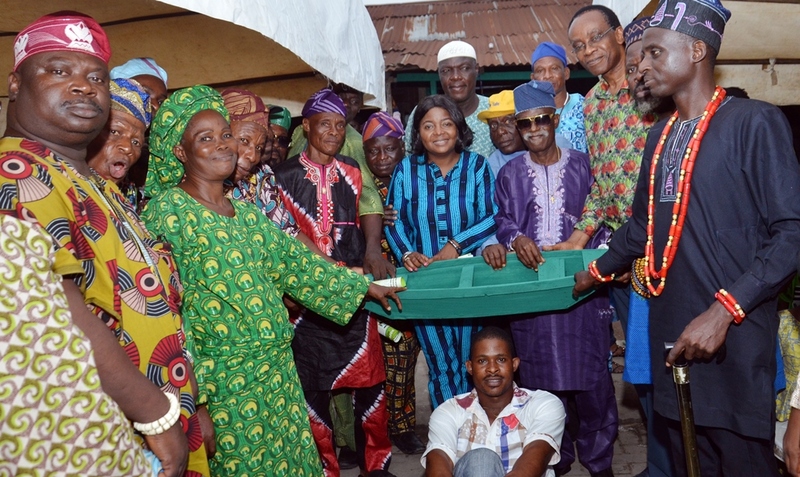 The community, in appreciation, presented a mini boat to Nnimmo, also in celebration of his 60th birthday. It was a crowning glory for the Benin City-based, Akwa Ibom State-born activist, one of the activists who tool the Niger Delta cause to global platforms. Bassey’s work has attracted recognitions from across the world. He was recognized by TIME Magazine as one of the 100 Most Influential Persons in the World in 2009 and the Goodluck Jonathan Government honoured him with a National Award. In 2010, he was recognised as a ‘Right Livelihoods Award winner, also known as the Alternative Nobel Prize. He is the first black man to head Friends of the Earth, an international group of 74 countries, as chairman, and serving two terms. Nnimmo, as he is widely known, is also currently involved in the global fights for food security, forestry rights and general human rights. He has published about 17 books cutting across poetry, the environment, food security, architecture among others, all geared towards a more humane and liveable planet. His fight for justice has also attracted to him persecutions in the forms of arrests, detention and threats to life especially under the military rulership of Late General Sani Abacha.